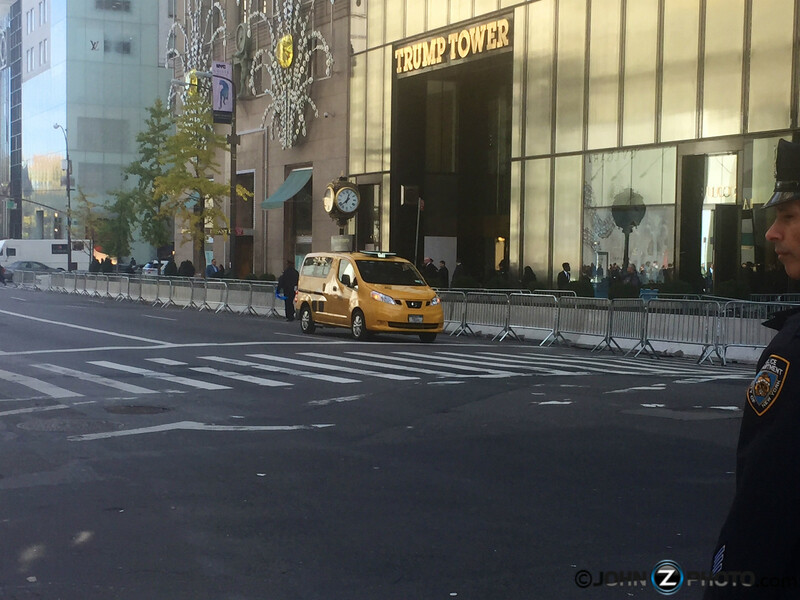 Just a few hours after being elected the 45th President of the United States, the NYPD began significantly beefing up security around Trump Tower in New York City which is President elect Donald Trumps current private residence. 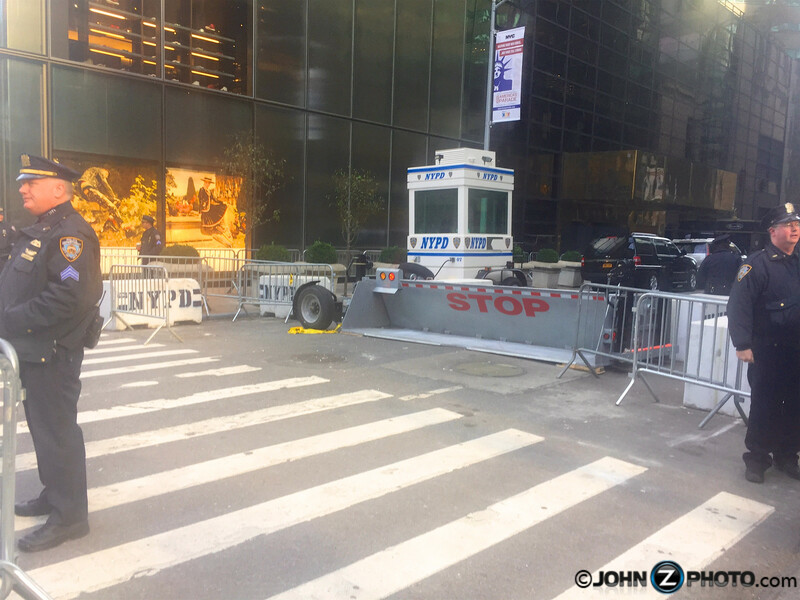 The video below shows the NYPD installing a new guard booth outside Trump Tower on the Morning of November 9th 2016. In addition, 56th street which was previously a through street open to pedestrian and vehicular traffic has now been closed until further notice. The video below shows concrete blocks being installed in the street to prevent cars from entering. In order to allow vehicles in and out, they have installed mechanical Stop gates at both ends of the block that raise and lower as needed. This is the 5th avenue side. And this is the Madison Avenue side. With matching a guard booth. 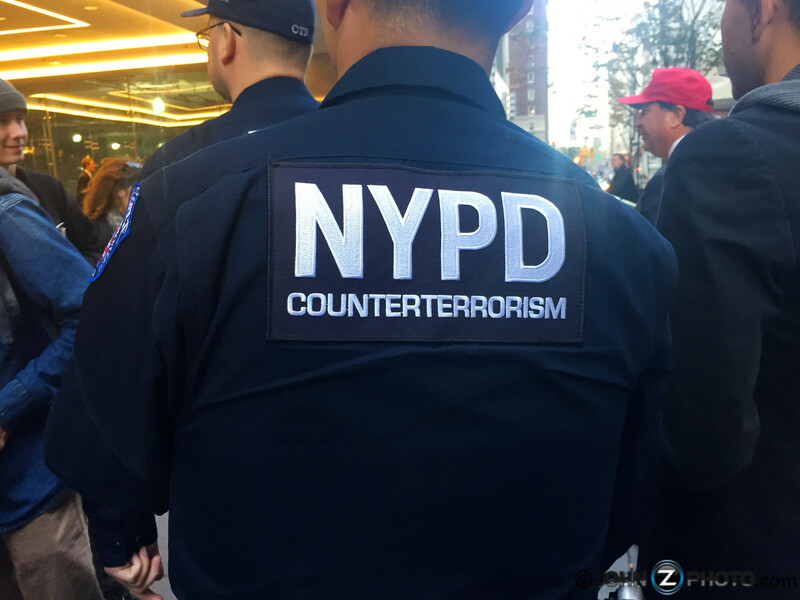 On November 8th, 2016 (election day) security in New York City was no joke. 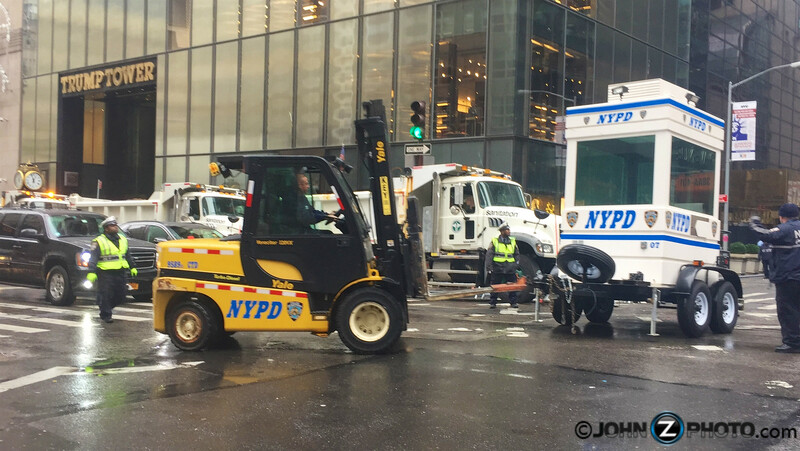 Trump Tower was surrounded with large department of sanitation fully loaded dump trucks to protect from any possible bomb blasts. 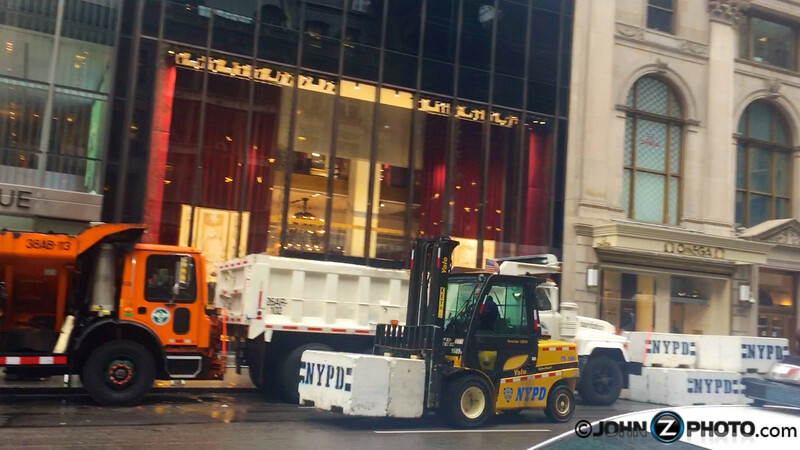 The street where Donald Trump and the resistents of Trump Tower enter and leave the building was also blocked with the large trucks leaving only enough room for a car to drive between them. 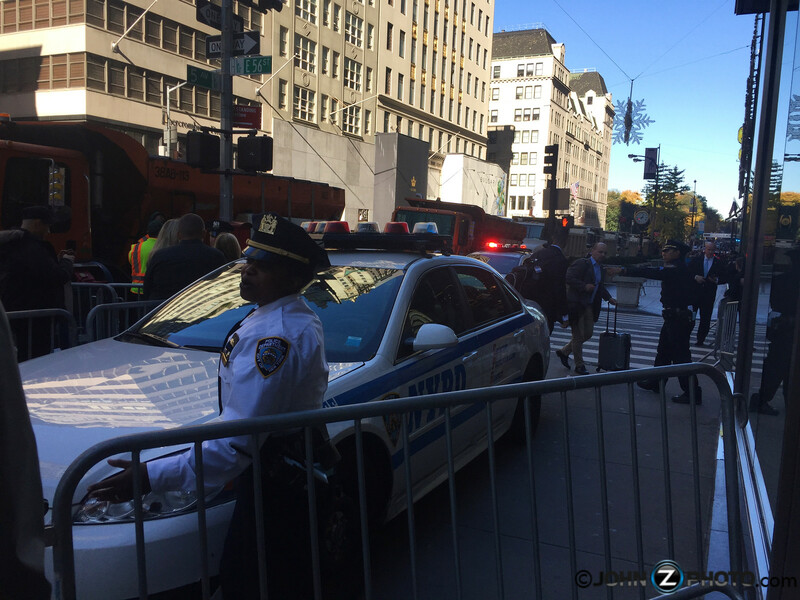 Police cars were parked on the sidewalks behind the large trucks. 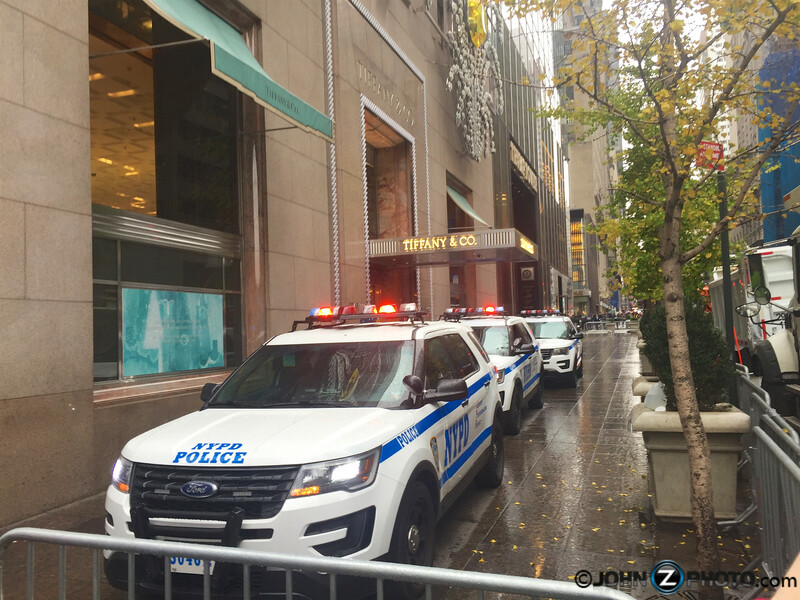 In an already tense election and under the reports of an imminent terrorist threat, Hillary Clinton, was staying just one block from Trump Tower at the Peninsula Hotel bringing even more security to the area. 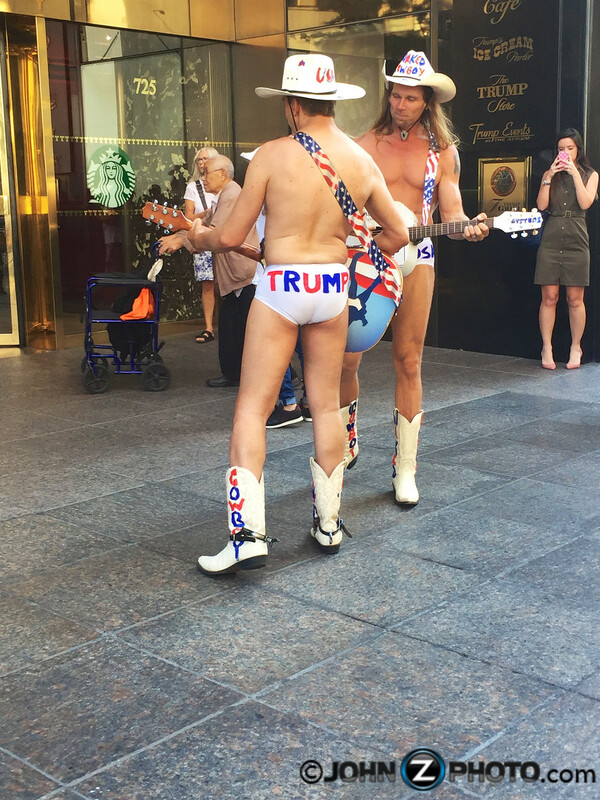 This was the scene on election day outside the Peninsula Hotel. 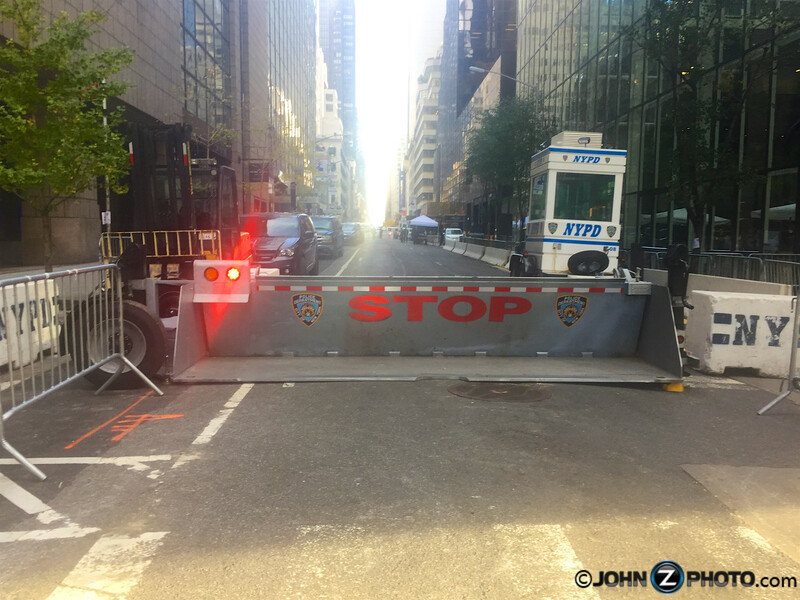 Normally a 5th Avenue sidewalk bustling with people, now closed and baricaded with large trucks and metal gates. 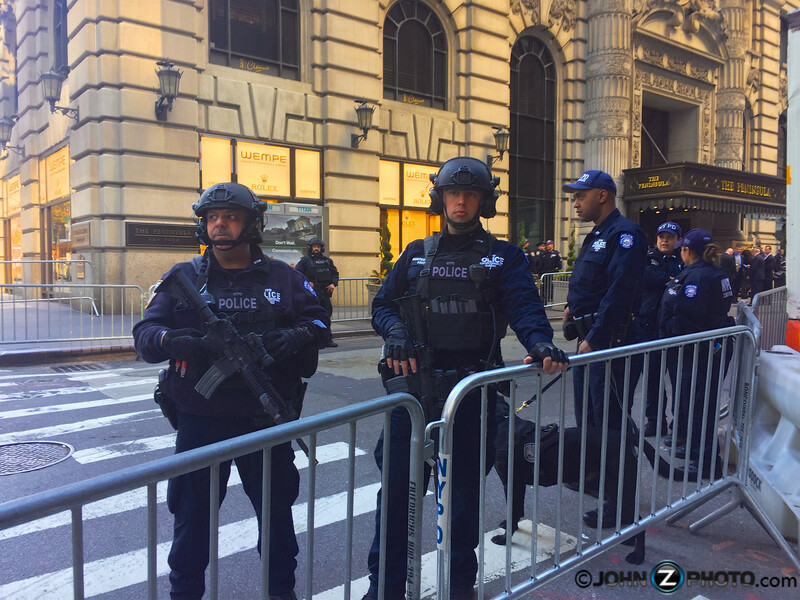 Access to the block was restricted and being defended by heavily armed guys like this as well as K9 units from both the NYPD as well as the Secret Service. 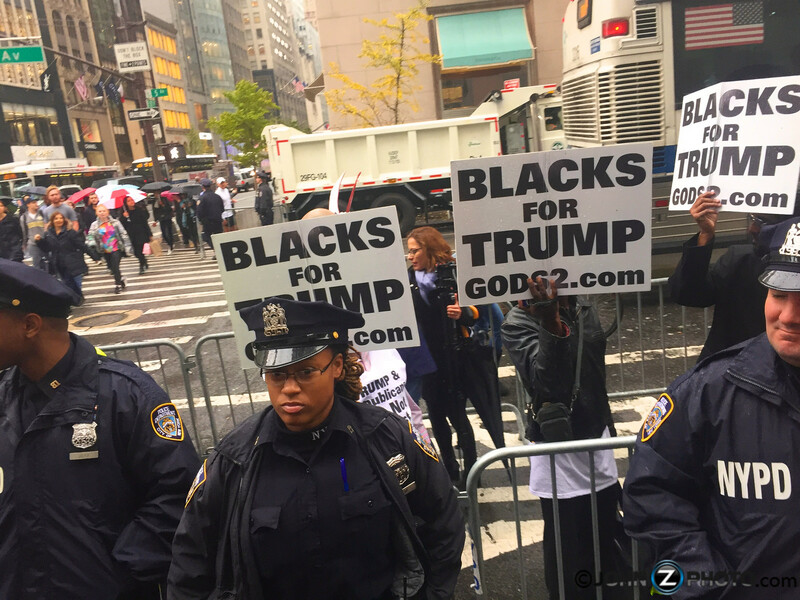 Meanwhile, just one block over from all this, Donald Trump was scheduled to hold his victory party at the Hilton Hotel. Because of this, the area was turned into a media circus. 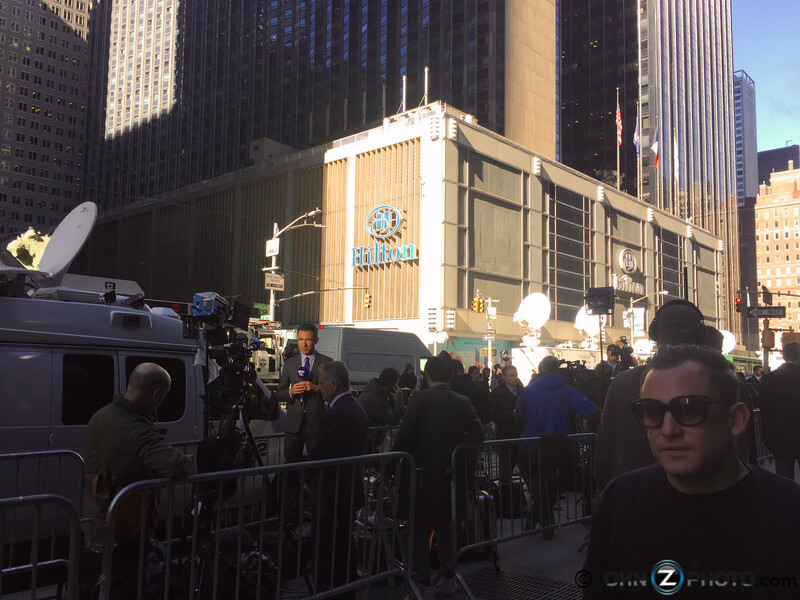 The video below shows a line of reporters from throughout the world reporting outside the Hilton Hotel in NYC. 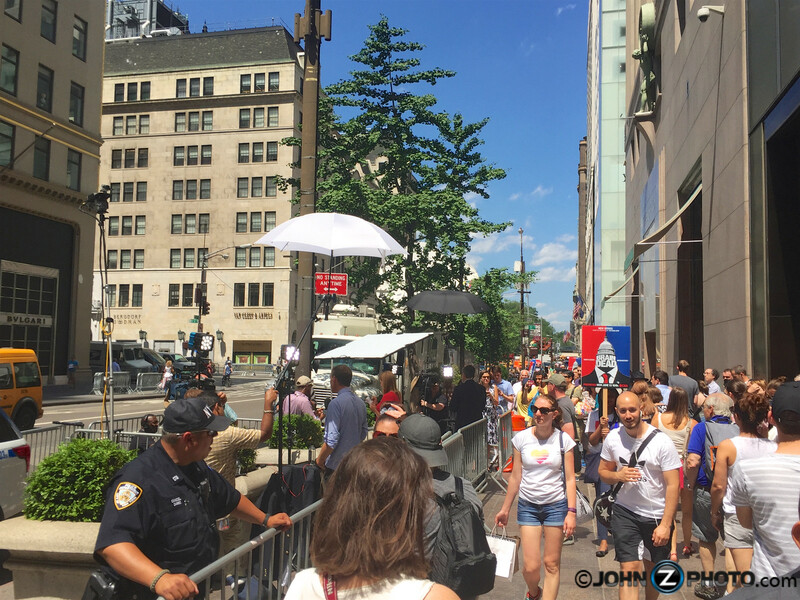 This area was also deemed another high security zone with everyone on alert. Full streets were shut down and fortified while K9 sweeps were conducted as shown below. 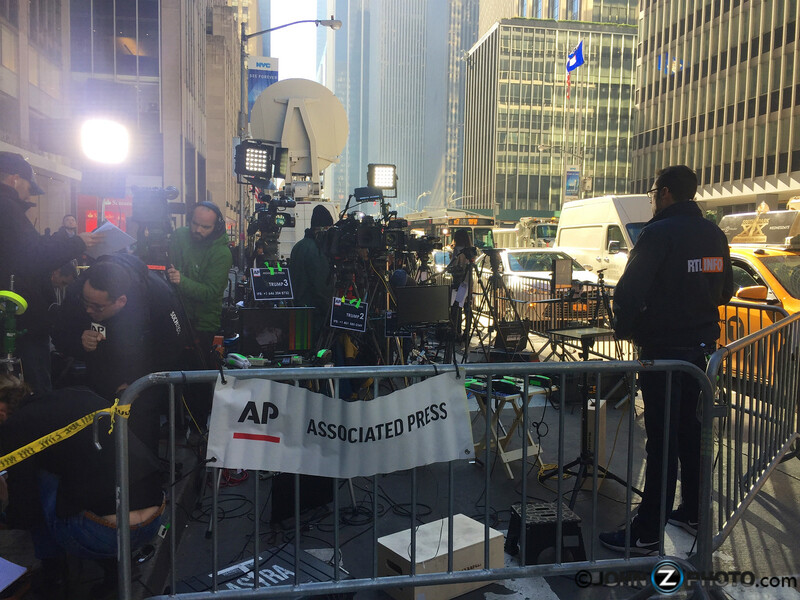 On election day, all the media outlets were ready to cover the results in their own way. 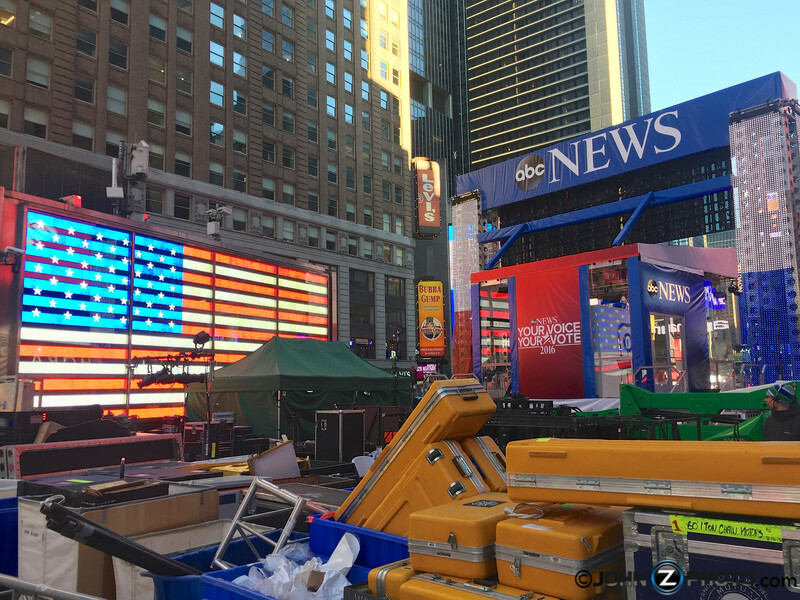 Fox News setup large video screens and lights in preparation for hours of coverage. 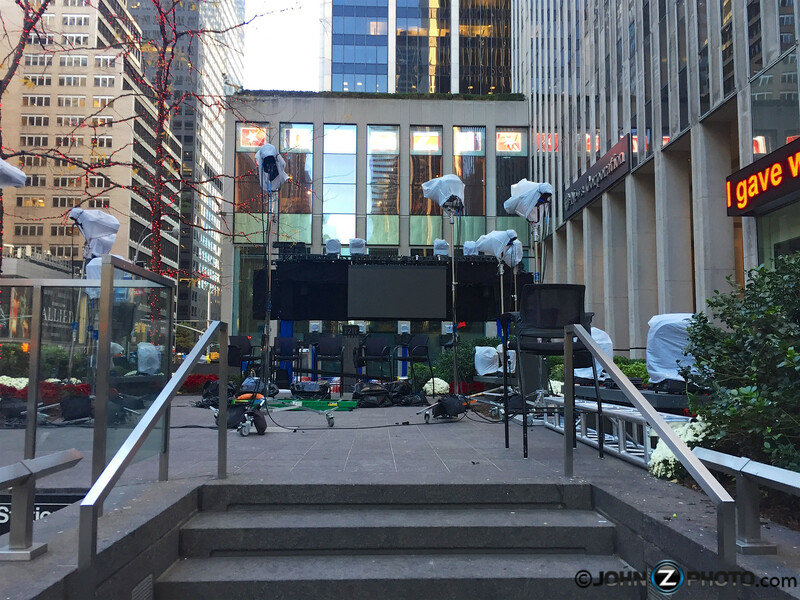 The stage was located outside their studio under the famous news ticker that wraps the building. 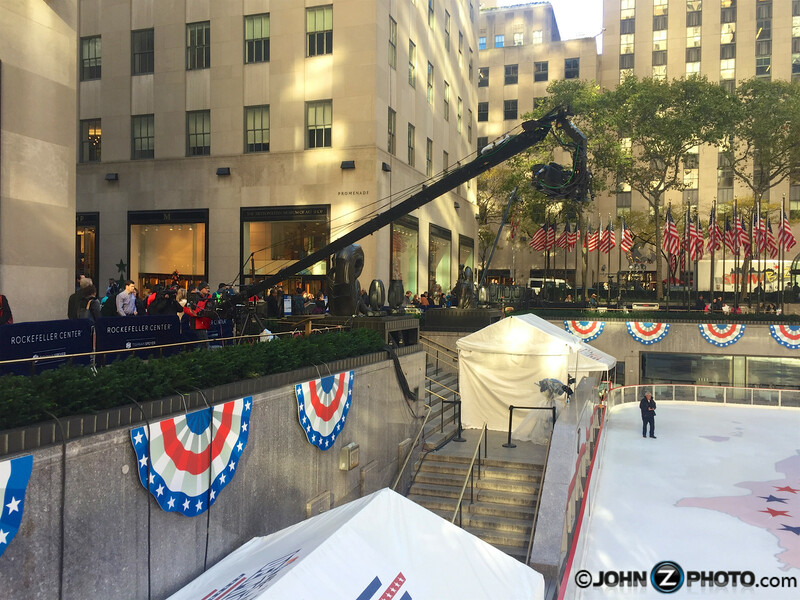 But perhaps the most elaborate coverage was over at NBC who turned Rockefeller Center into Democracy Plaza. 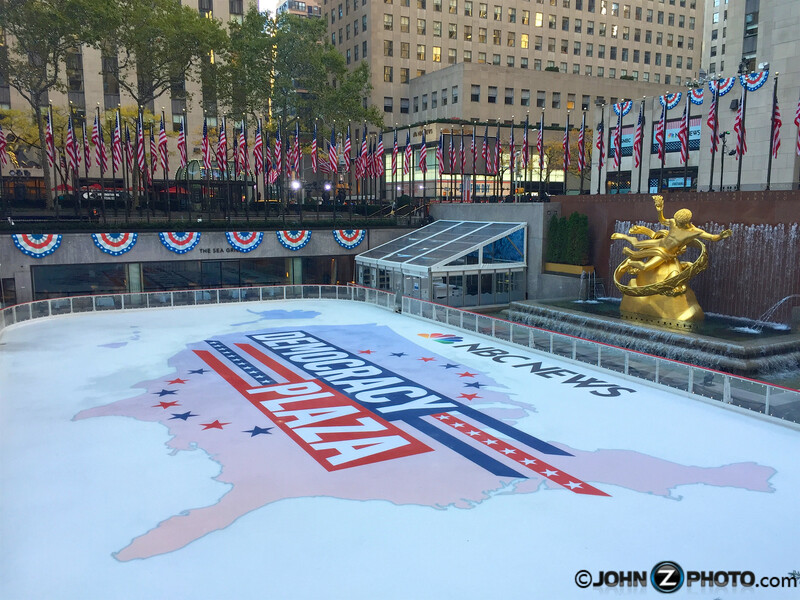 The famous ice rink was closed and blazoned with a giant logo of the United States. 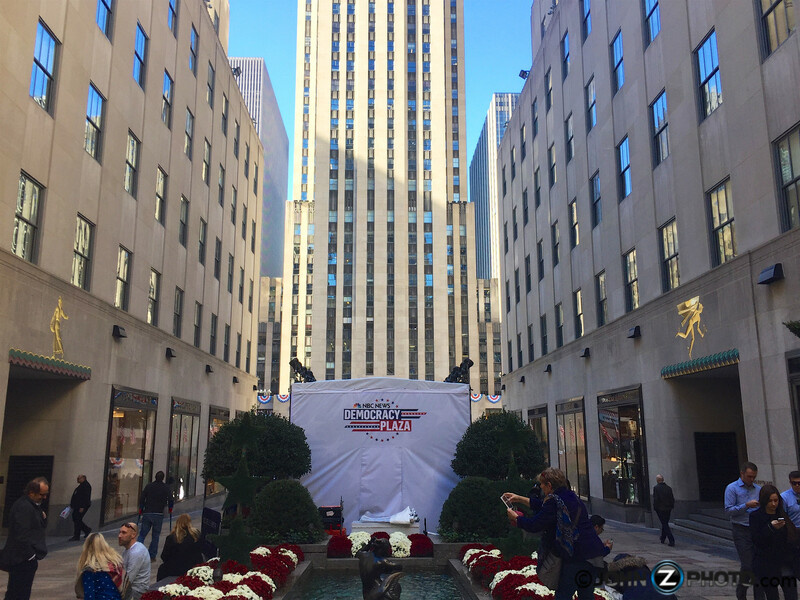 Everything was decorated with a red, white, and blue theme just before the famous Rockefeller Center Christmas tree was to be setup. 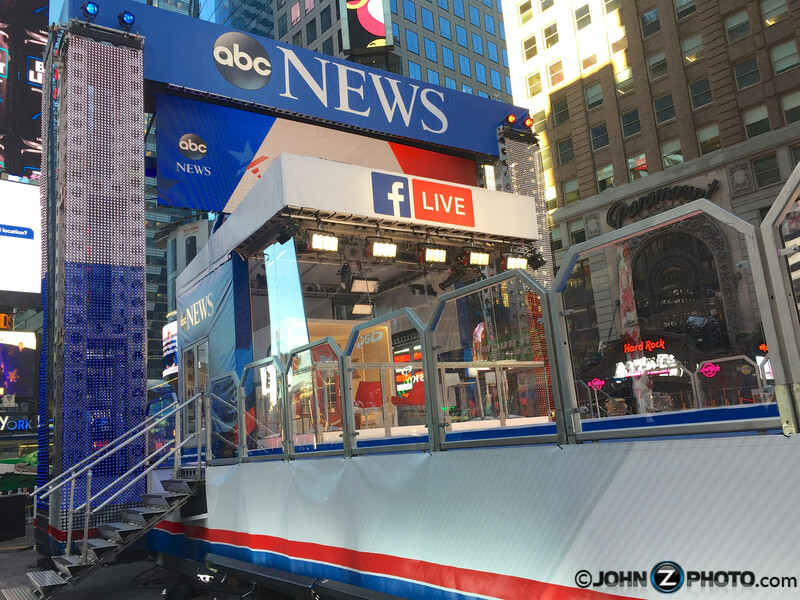 With lights everywhere awaiting nightfall and sweeping camera booms, they were ready for round the clock coverage of the election results. 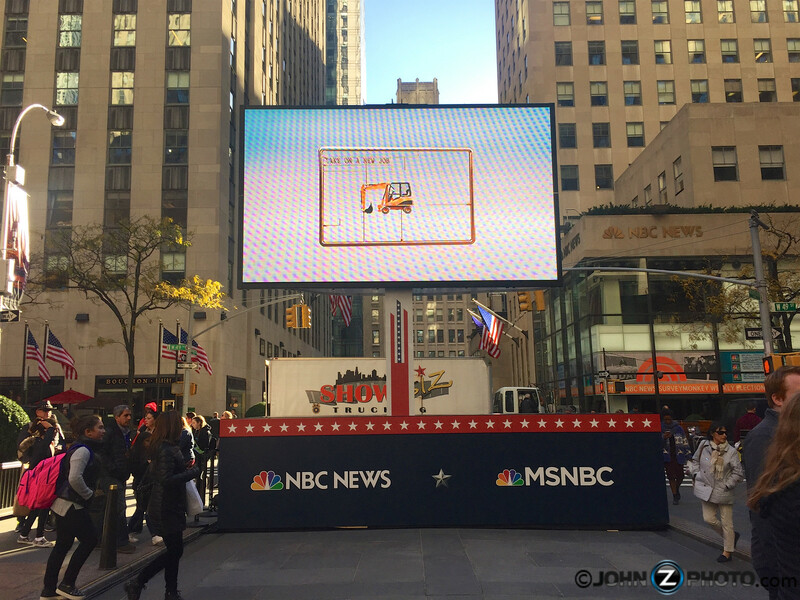 NBC News also setup large video screens so everyone was sure to see the results just outside the today show studios. I would say this was quite an upgrade from years past. I took the below photo in Rockefeller Center during the 2008 election between Barack Obama and John McCain. As you can see, things were much less elaborate. It all began in 2015 with Donald Trump announcing his candidacy for President of the United States. At that time, he was still the New York City billionaire frequently sighted around New York. These photos were taken shortly after he announced his run for president. 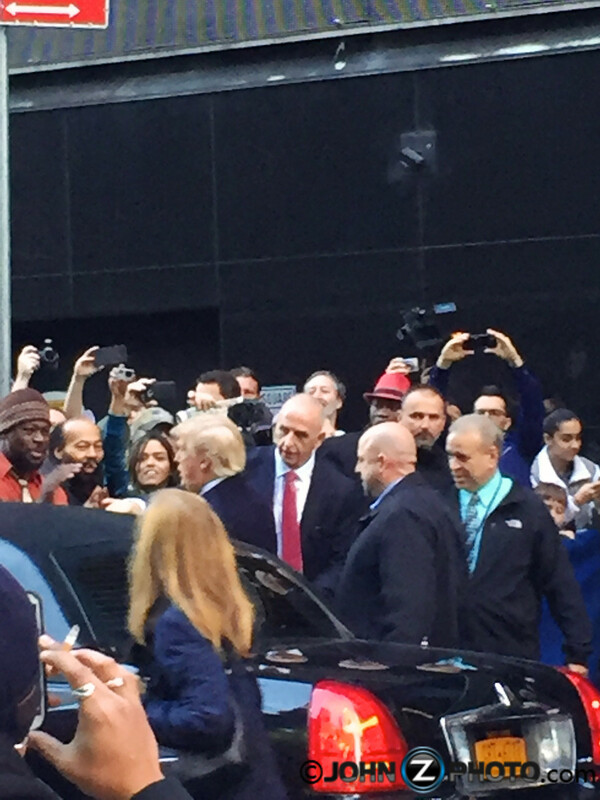 I spotted him one morning leaving ABC studios in New York City getting into his limo. It’s very unlikely that crowds will ever get this close to him ever again. 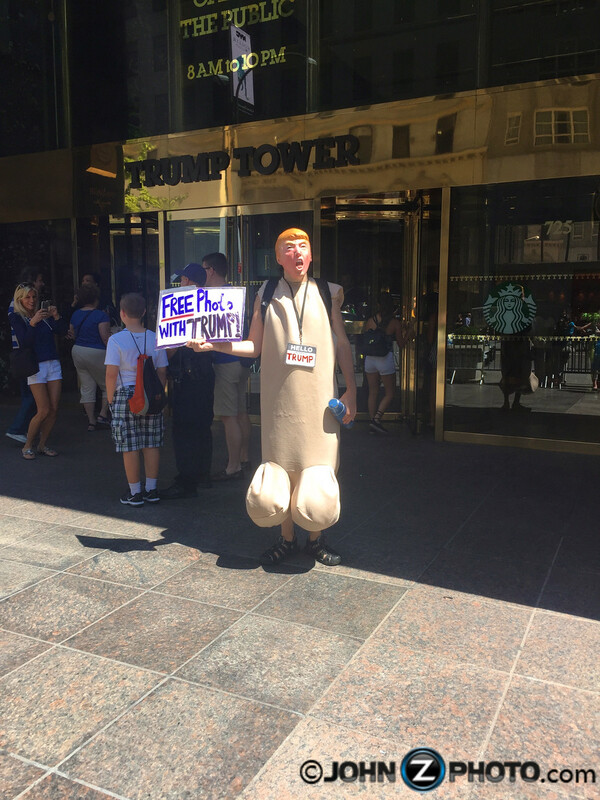 However, throughout the summer of 2016, the scene outside of Trump Tower was quite interesting. From early on in the spring and summer of 2016, there were police, crowds, media, protesters, and supporters as seen in the video below. From time to time there were even people that showed up in costume to protest, support, or maybe just make a few bucks. 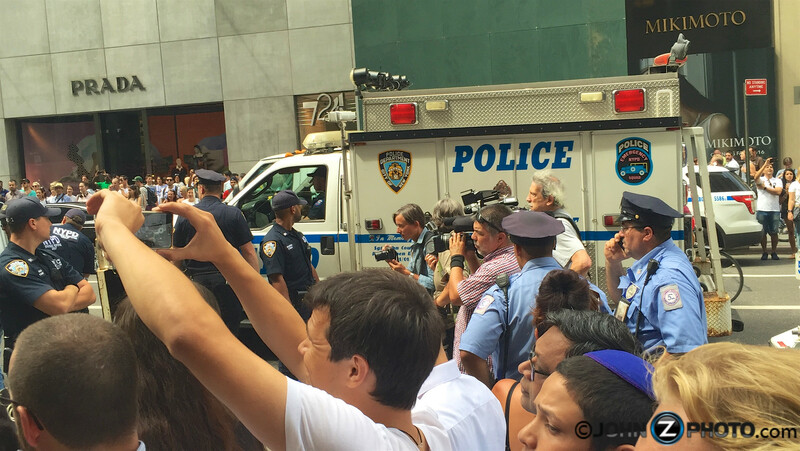 However, on some days the protests became serious and the NYPD showed up in force to handle the crowd. 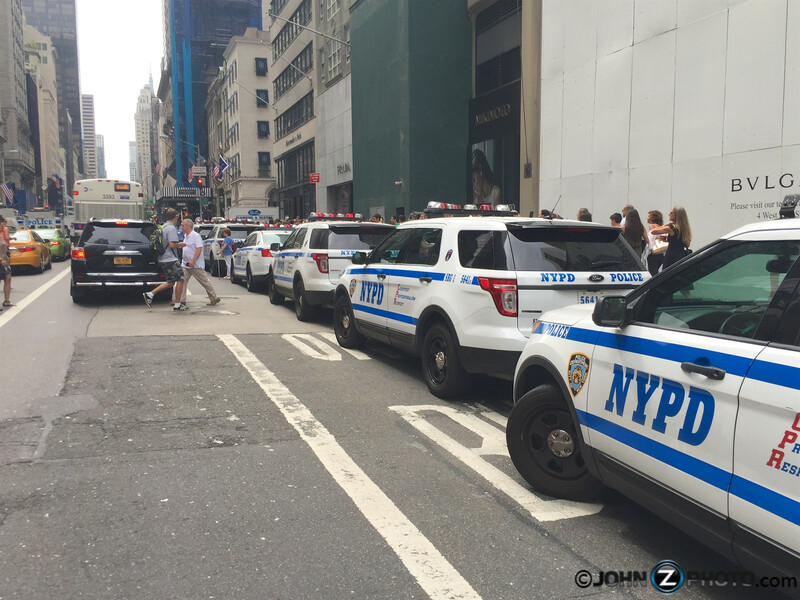 Hundreds of officers arrived within the matter of minutes in response to an escalated issue at Trump Tower. 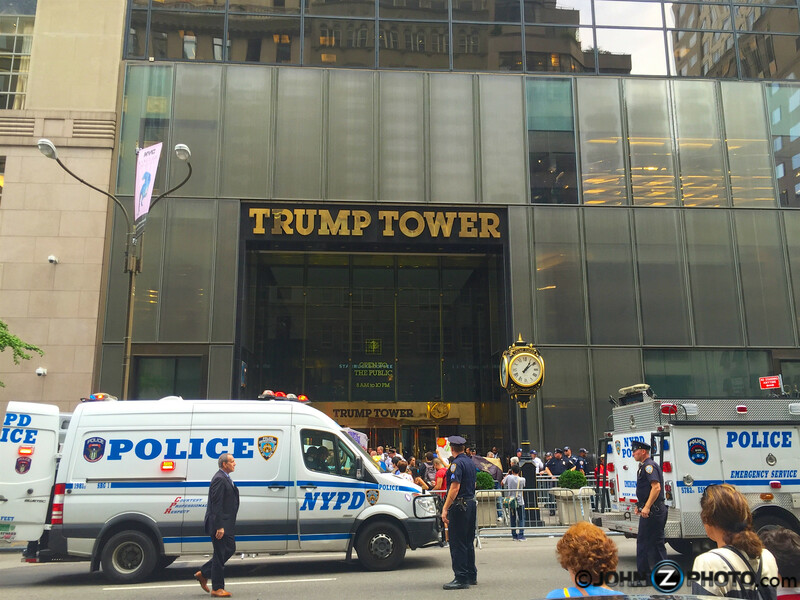 In this case, a group of individuals were removed from Trump Tower and arrested as shown in the video below. The scene that day was very chaotic. The area was quickly shut down with metal barricades while the police responded and handled the issue. Within a short amount of time, hundreds of people had gathered at the scene. While some days there were protests, other days were comical. 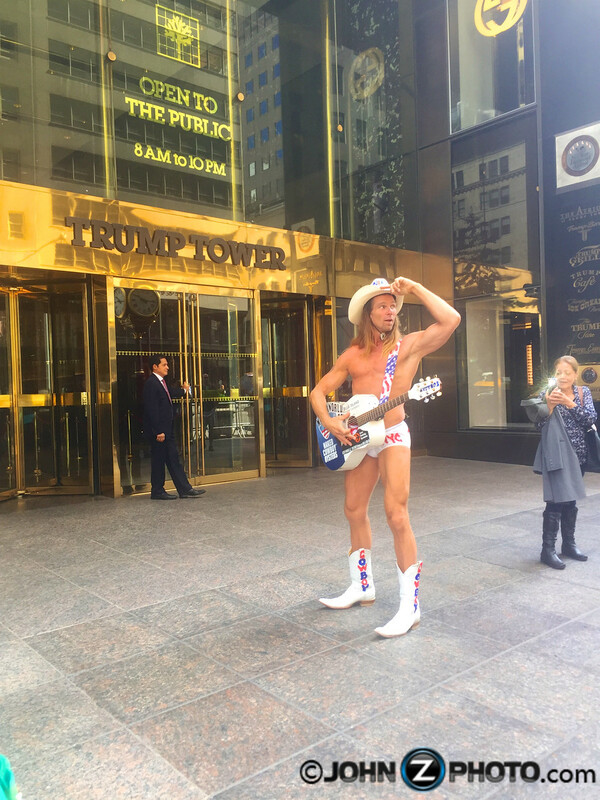 Apparently, the “naked cowboy” moved from his normal spot in Times Square up to Trump Tower for a few days a week. And it doesn’t seem he had any problem adjusting to his new spot. 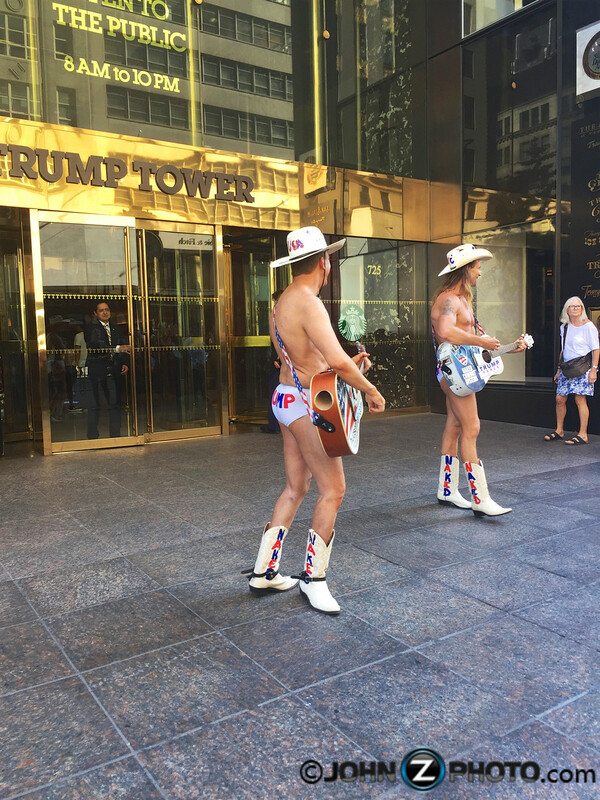 It was so funny, that apparently, local folks even decided they should dress up like the “Naked Cowboy” and perform right along side him. Which seemed to entertain the crowds that began to gather. 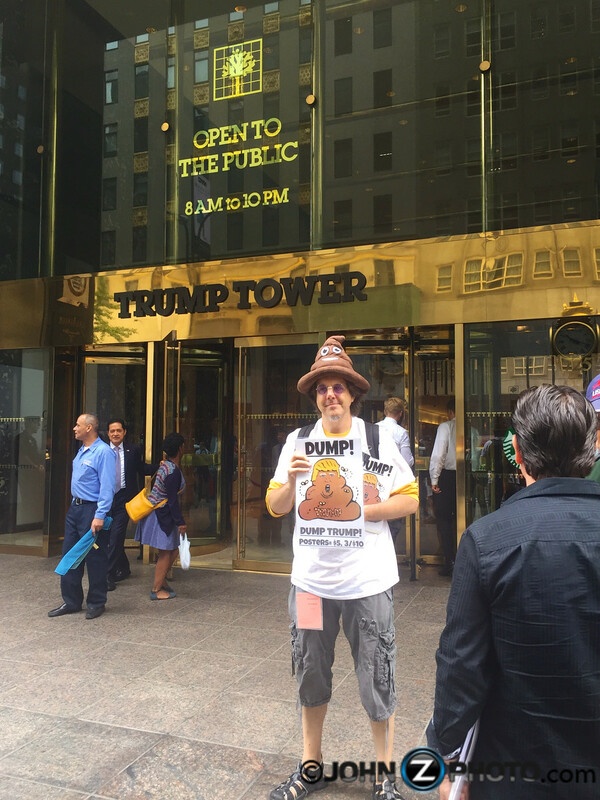 It seemed many were looking for attention or to make a few bucks from the newly famed Trump Tower, including this guy who was selling Dump Trump posters. 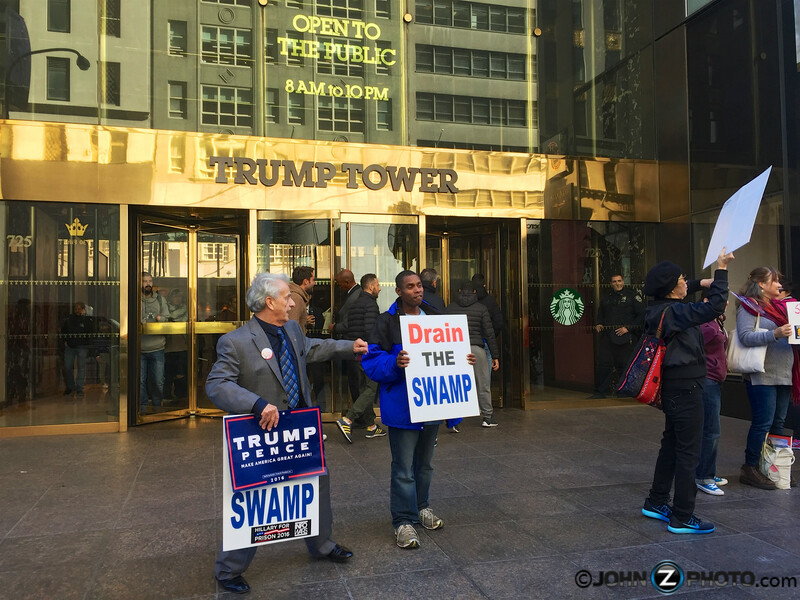 As the election neared the supporters and protesters really started to show up. 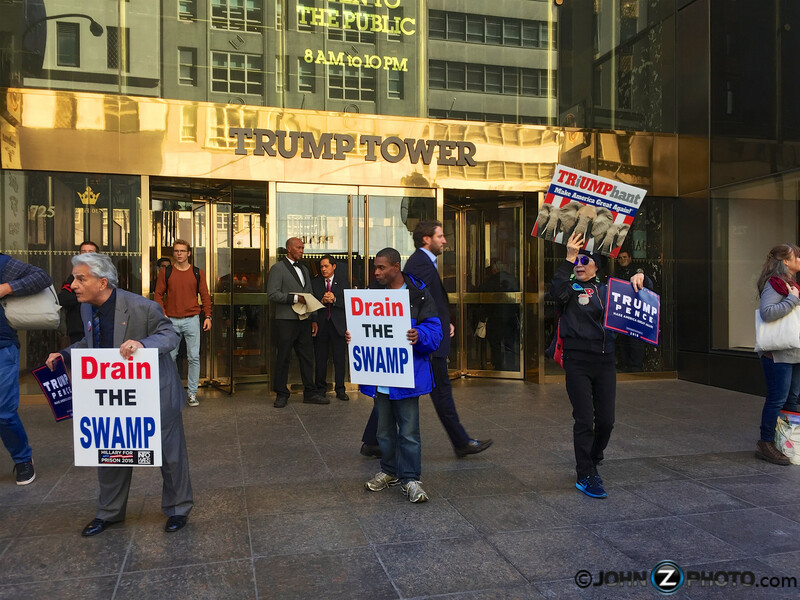 At this point, Trumps famous “Drain the Swamp” slogan had become popular among Trump supporters. Even in the video below, you can see Trump supporters along side Trump protesters. 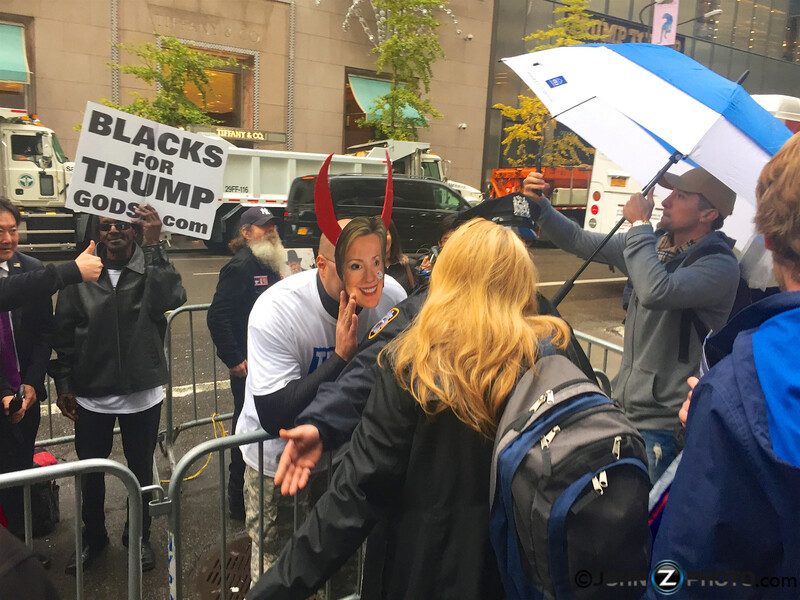 In the day or days just before the election, the people that showed up to protest for or against the candidate were VERY passionite. 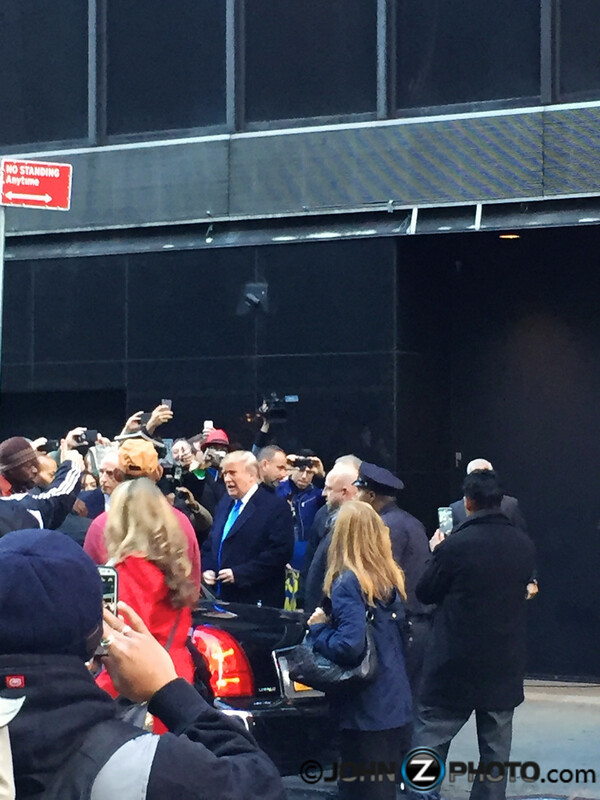 On November 9th, just hours after the announcement that Donald J. Trump had won election for President of the United States, I captured Hillary Clinton’s motorcade in the video below leaving her hotel on the way to deliver her now infamous consession speech. 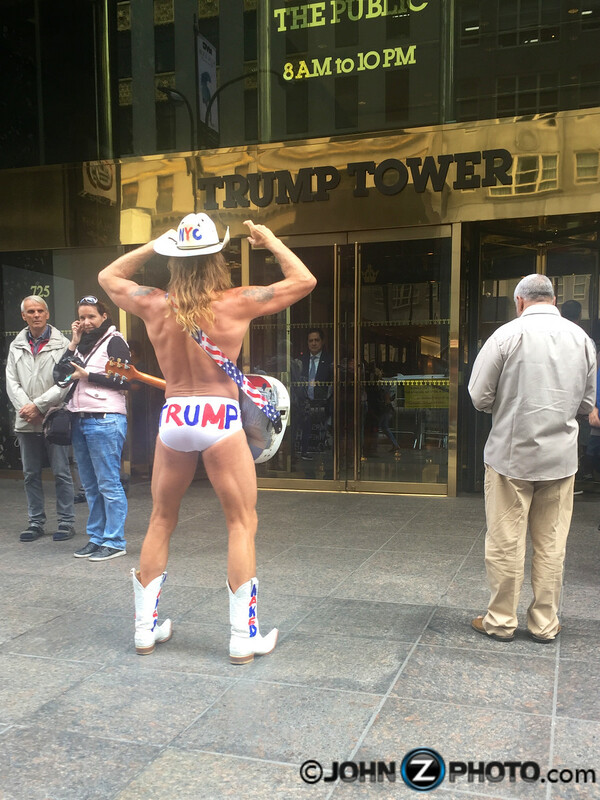 Meanwhile, a few minutes later, the scene around Trump Tower quickly became chaotic. 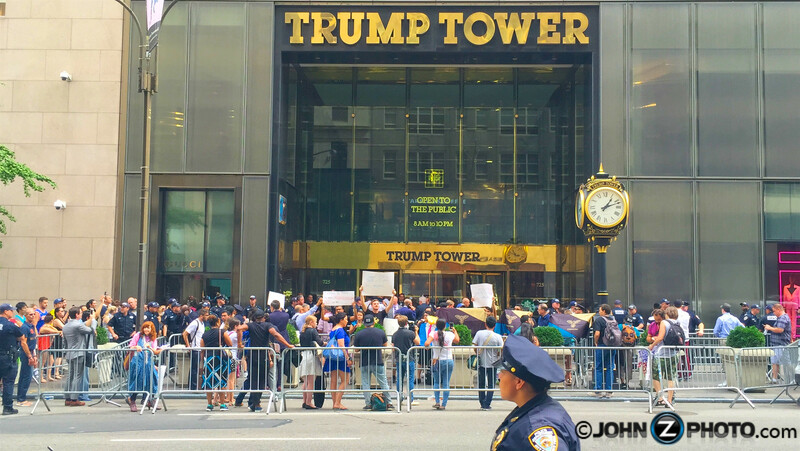 The NYPD quickly fortified Trump Tower. And soon protesters again showed up to voice their support or non-support for the newly elected president. It was clear that people were still passionate either for or against the decision. 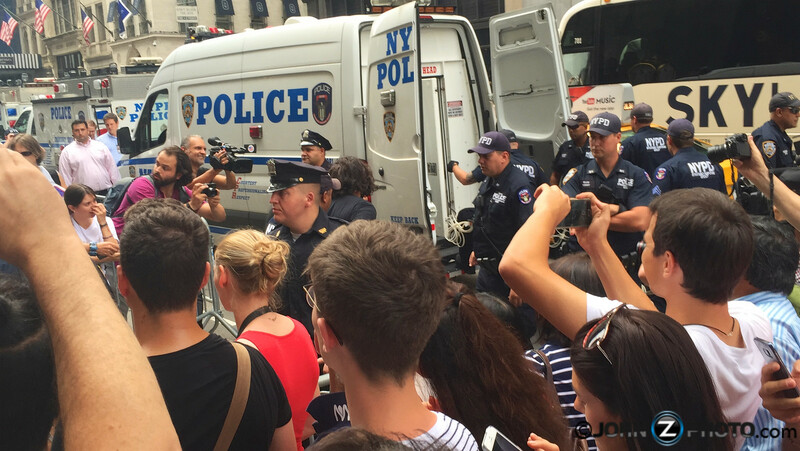 In the below interaction, a Trump supporter taunts a Hillary supporter while a member of the NYPD needed to intervene between the two. 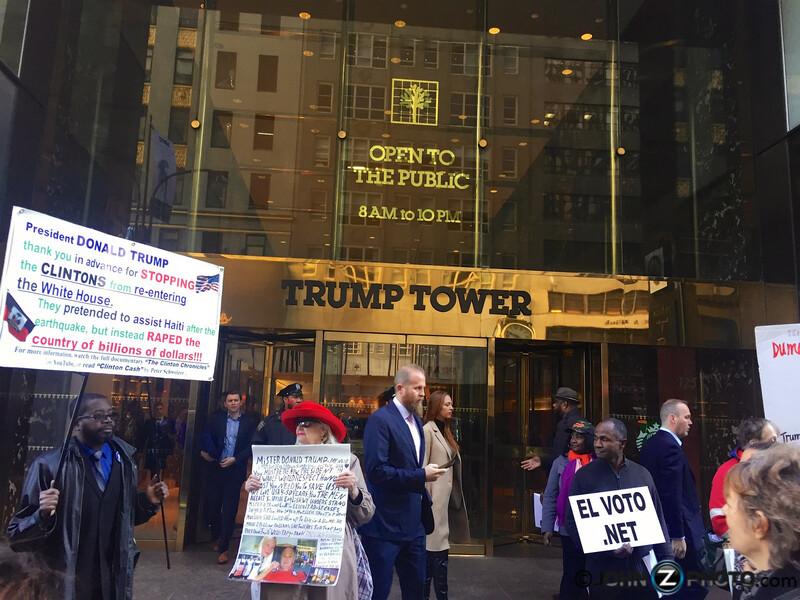 In the video below a protester yells outside of Trump Tower about the bombing in Yemen. 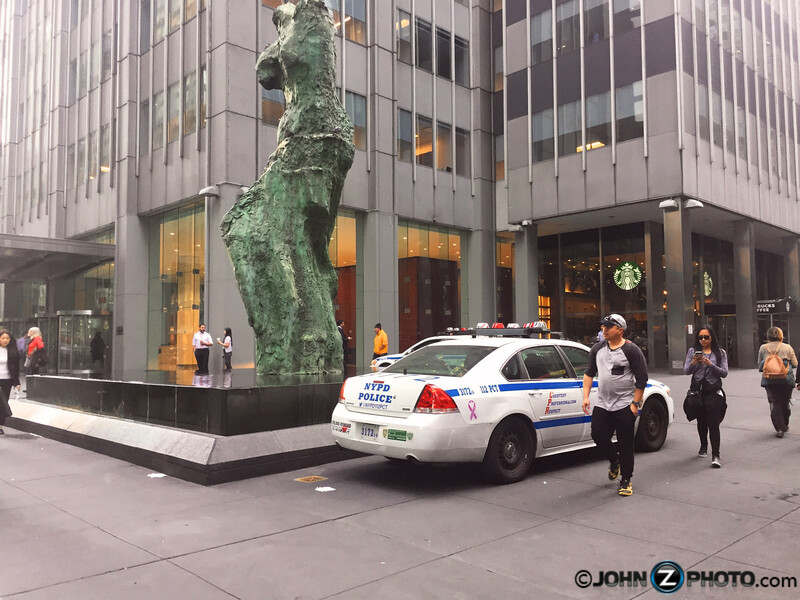 Across the street, the NYPD quickly became concerned about a women attempting to light the American Flag on fire. The video below shows the girl attempting to light the flag on fire while the secret service and NYPD look on along with the public. 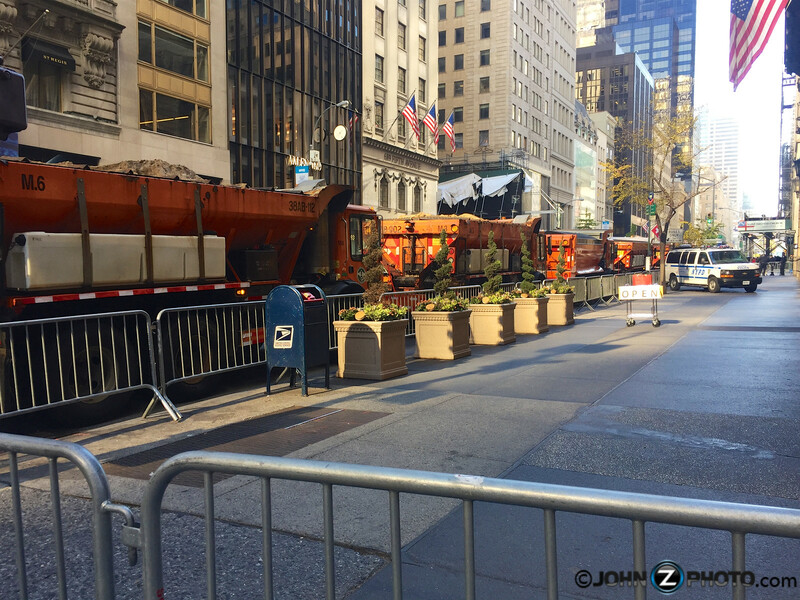 Well at this point in the few days after the election, the large dump trucks have been removed from Trump Tower and replaced with concrete K-rails and a double layer of metal gates. 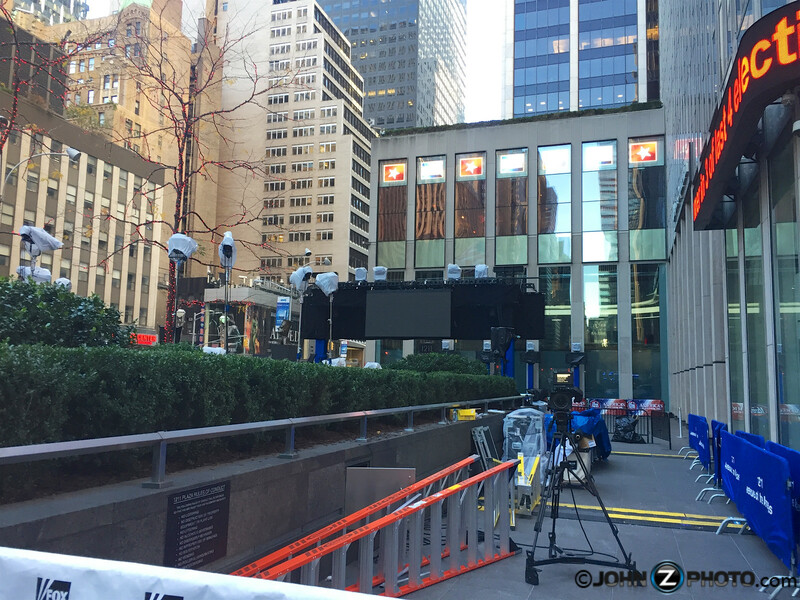 However, the media have officially set up shop just across the street as seen in the video below. 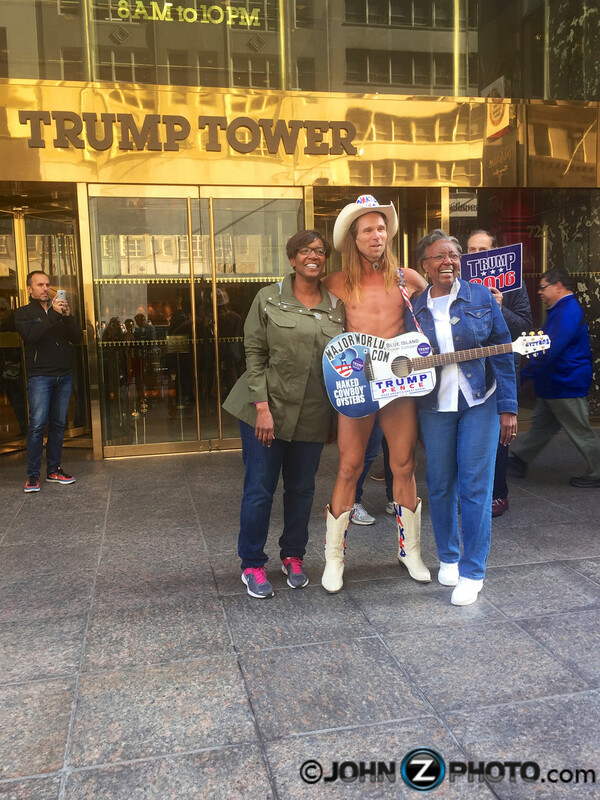 So it’s been a crazy year in the area of Trump Tower, but I’m sure it’s only the beginning. 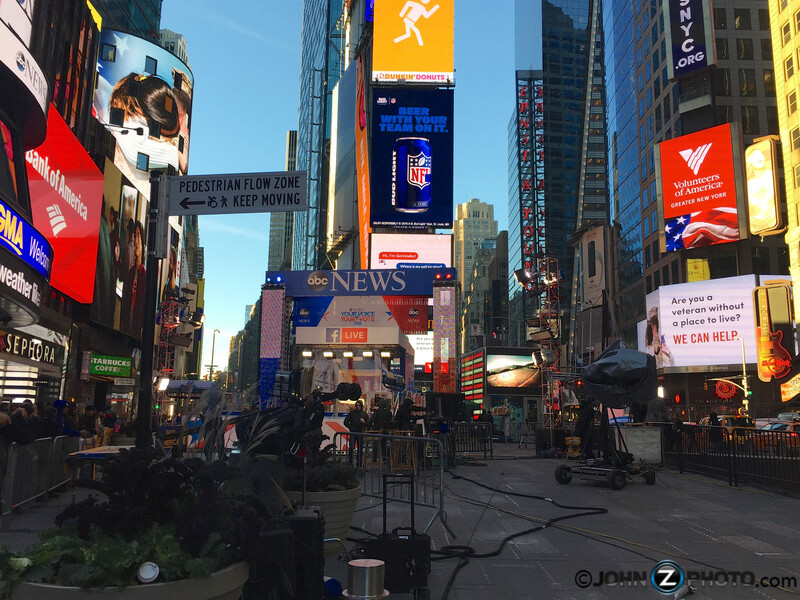 This entry was posted in America, Election, Entertainment, Finance, History, New York, politics, Pop Culture, Uncategorized, Wall Street and tagged elections, New York, politics, security, Trump, US History. Bookmark the permalink.